Finalist, Governor General’s Literary Award (English Non-Fiction), 2002. 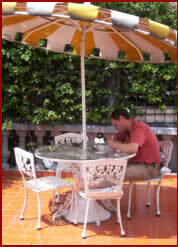 A Globe and Mail “100 Best Books of the Year” Choice, 2002. Erin, Ont. : The Porcupine’s Quill, 2002. When Words Deny the World is a compelling report from the front lines of Canadian writing. In a series of maverick essays, fiction writer and literary journalist Stephen Henighan takes on the decade of the 1990s, when Canadian writing bcame before all else, a commercial enterprise. Where most commentators have disregarded the impact of globalization on the way Canadians write and publish, Henighan makes this his central concern. Examining both Canadian fiction and Canada’s changing literary institutions, Henighan explores subjects ranging from best-seller lists to the Giller Prize, from “voice appropriation” to Toronto-centrism, from Americanization to the literary languages of the Americas. He traces the disintegration of the traditional Canadian linked short-story collection and probes whether Canadian writers abroad can be considered “post-colonial.” Analysing novels such as Michael Ondaatje’s The English Patient, Anne Michaels’s Fugitive Pieces and Carol Shields’s The Stone Diaries as expressions of a free trade culture, he reaches conclusions that are original, irreverent and devastating. Belonging to no clique and respectful of no orthodoxy or party line, Henighan has created a passionate personal record of one writer’s engagement with a shifting literary landscape that is also a thoughtful, erudite account of where our literary culture is going. Henighan is the first Canadian literary journalist to take a penetrating look at the impact of globalization on Canadian literature – and what he sees isn’t pretty….it’s the liveliest, most cogently argued, most provocative and most infuriatingly self-satisfied work of literary criticism to be published in this country in at least the last decade. Consequently it’s a must-read for anyone with even the slightest interest in either the literature or the culture of Canada. How compelling is When Words Deny the World? I received a review copy consisting of loose leaf pages in a binder, and I read it like a mystery novel. I couldn’t put the damn thing down, even when my wrists got sore from holding it. When Words Deny the World is crucial reading for anyone concerned about Canadian writing or, for that matter, our sense of identity. It is, perhaps, the past ten years’ most insightful examination of what has sadly become a superficial book business. The most clear-sighted, bracing and provocative collection I have read in years. What a joy his new book is. When Words Deny the World…is impassioned, contrarian – and the work of a wide-ranging and avaricious reader, obviously. Not categorically, but sufficiently frequently, are Henighan’s views jarring – on the significance of place in CanLit, on the effect of free trade on national literary debates, and the consequences of our writers living on the margins– that I hesitate to praise him too much lest the man feel unjustly seconded to exactly the literary establishment he so enjoys denigrating…. A riveting read – something one hardly says of literary criticism every day! It is not the least of the virtues of this collection that it challenges a good many of us in the literary journalism racket to re-examine our approach to Canadian literature. Henighan, a novelist and short story writer and instructor in Spanish-American literature at the University of Guelph, who was raised in eastern Ontario, but lived for years in Montreal and England, writes very much as an aggrieved outsider…. What makes the book as a whole hard to ignore are the evidences, provided throughout, of Henighan’s powers as a literary critic. Those powers are considerable, which is bad news for such popular “literary” writers as Jane Urquhart, Bonnie Burnard, Carol Shields, Timothy Findley, all of whom Henighan eviscerates…. This is criticism that is non-academic, readable, respectful of genuine literary accomplishment and merciless towards pretence and muddle. How badly we need it. A compelling argument….Some of the most blistering and erudite pieces of Canadian literary criticism ever published. Such is the depth of Henighan’s reading and such is the passion of his writing that the reader is forced to re-examine a lifetime’s reading and opinion….Henighan’s book should be read by anyone who cares about our literature. 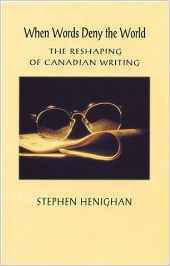 For anyone with even a passing interest in the course of Canadian literature, Henighan’s unusual mix of literary and political criticism is too eloquent and captivating to be ignored…it’s a kind of wake-up call, possibly a bright beginning of real literary debate in this country. Stephen Henighan pounds home the theme of the Canadian novel’s actual betrayal of history. His analysis is brutal and important…. He not only kills sacred cows, but he tortures them first. One might not necessarily agree with him, but his audacity is compelling and it is hard not to find yourself nodding in agreement….